In the past month, two new signed cycle routes have opened in Islington. 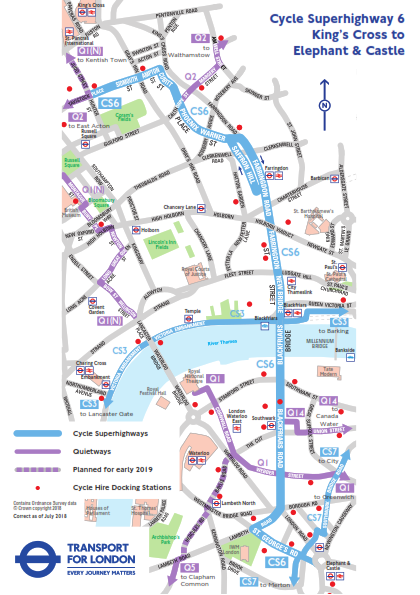 Cycle Superhighway 6 runs from Elephant and Castle to Kings Cross, passing through Islington, and features segregated lanes away from other traffic, along with redesigned junctions which have improved priority for cyclists. Quietway 2 runs from Bloomsbury to Walthamstow on a network of quieter residential streets and cycle tracks, intersecting with both CS6 and CS1. If you’d like an introduction to these routes (or if you haven’t yet come across their new features, like “two-stage turns” for cyclists) then why not book a free cycle skills session where one of our qualified instructors can show them to you? 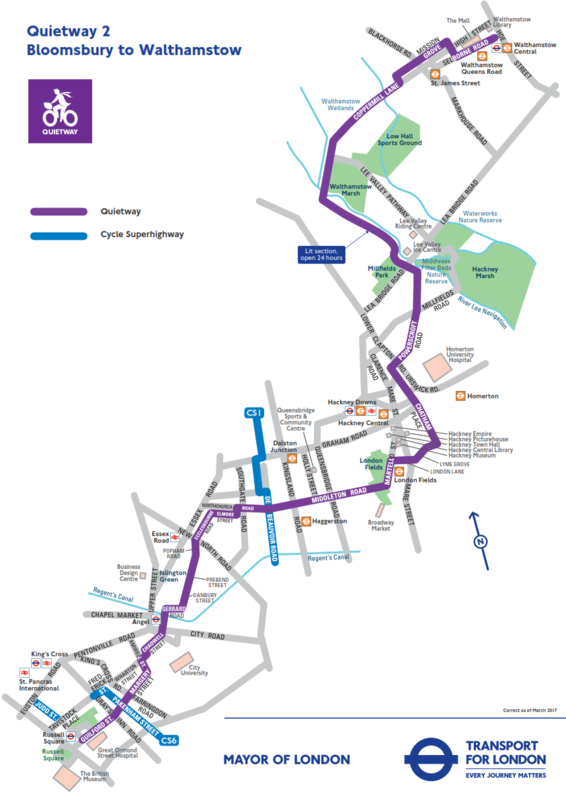 Maps of Cycle Superhighway 6 and Quietway 2. They are taking place at venues in N4 and N1. For full details and to book, click here. With colder and wetter weather around the corner, it’s more important than ever that your bike is properly set up to keep you riding comfortably and safely. 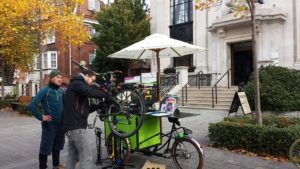 Our free Dr Bikes continue through autumn in two different locations each month. Come to the Town Hall on the first Wednesday of every month, or Navigator Square in Archway on the third Tuesday of every month. All sessions run 4pm-7pm, and you can view exact dates and locations here. Our mechanics can check everything on your bike from wheels, brakes, gears and tyre pressure to lights, racks, pedals, saddles and more. Any minor adjustments we can make to your bike, we do there and then. If there is something we can’t fix, we’ll let you know exactly what needs doing and a rough guide to what it should cost to repair at a local bike shop. If you’re a beginner (or an improver) and want to practice off-road to learn to ride a bike, you can do a free basic cycle skills group course. More advanced cyclists wanting to improve their on-road riding can book some individual cycle skills sessions. You can also learn how to ride together as a family, by booking a family cycle skills session. For the past six years, the Islington cycling team have run a summer festival in Finsbury Park (alongside our colleagues from Hackney and Haringey). This year’s festival of Cycling and Walking (called ‘Saddle and Sole’) was the best–attended yet, and has also been shortlisted for a National Sustainable Travel Award. More news in our next newsletter. If you would like a stall or would like to run an activity at next year’s festival, email david.shannon@islington.gov.uk.